"The uprising started at 9am," he says. "By 5pm the streets were strewn with the dead - poor people, daily wage workers, coolies (porters), and innocent people who were only passing by"
The public mourning for 4,785 people killed during the first 20 weeks of communist rule has brought back memories of tens of thousands of others who were abducted and disappeared or killed. Few people survived the brutal interrogations and incarceration. This testimony* is of Sayed Akbar Jafari who witnessed the Chendawol uprising. Jafari was only 26 in 1978 when the communists seized power in a violent coup. The post-coup d'état government was led by Nur Mohammad Taraki but he was assassinated in September 1979 by a fellow communist Hafizullah Amin. Both were from the Parcham faction of the People's Democratic Party (PDP). Amin's rule lasted only a little more than three months. He was killed by Soviet intelligence in December 1979 and power in Kabul passed to the hands of Babrak Karmal, leader of the Khalq faction of the PDP. Under both Taraki and Amin there was a wave of arrests and secret executions. 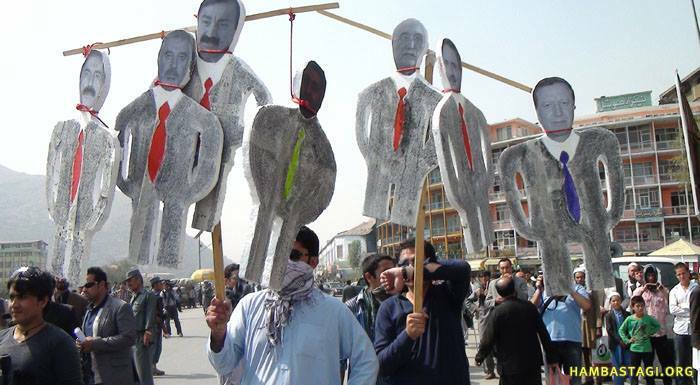 Anyone thought to threaten the new rulers including school students were detained, tortured and forcibly disappeared. After the first two months of communist rule the paranoid regime even turned on its own ranks: members of the PDP's Parcham faction. 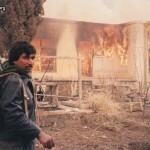 The Taraki government's brutal attempt to ram through a revolution from the top with a radical reform programme provoked widespread, largely spontaneous rebellion like the uprising in Chendawol in Kabul on 2ndSaratan (1358/23 June 1979). Jafari remembers the exact time of the rebellion. "The uprising started at 9am," he says. "By 5pm the streets were strewn with the dead - poor people, daily wage workers, coolies (porters), and innocent people who were only passing by. The protestors were under siege." He insists the uprising was of common people. The communist regime ruthlessly beat back protestors who launched the uprising with just loud cries of Allahu Akbar (God is great). "Only dead bodies could be seen in Sar e Chawk and Jade Maiwand (areas next to Chendawol). The voices raised in spontaneous protest changed into cries (of pain). The butchery went on all day," he says. Jafari remembers the government used tanks and other heavy weapons while the protestors were armed with nothing more than shovels and sticks. "It was impossible (for people) to defend (themselves)," he says. "Finally protestors attacked Chendawol police station. They occupied the police station and raided the armoury. But the oppressed people could not have won. There were airplanes (of the communist government) circling overhead. Security forces had besieged the police station. They could target anyone," he recalls. Worse was to follow on the night of 3rdSaratan. While the people were still gathering their dead, reserve units of the police entered Chendawol. They broke into houses and dragged away "elders, academics and professionals". The terror went on through the night. Jafari was a witness. It would be also the last time he saw his father. "They (armed police) entered our house at 1.30am. They beat my father and me and took us out of the house. I thought the moment of death had reached us. But I managed to escape. They took my father." The events of 34 years ago are crystal clear. "We, the people who rose in rebellion, believed only in God. We were not linked with any party. But we have been left with so many bad memories … cars with black glasses (tinted windows) would come every night and take people from their houses - beating and hitting them while their relatives wailed in fear and trepidation," he says. Jafari does not know what happened to his father. There were so many people who were taken away and disappeared, he says. On Sept 17 there was a closure in the cases of 4,785 people who disappeared under the post-coup d'état regimes of Taraki and Amin. The Dutch Prosecutor's Office released a list of names which was part of evidence gathered in a war crimes investigation in 2012. The Afghanistan Analysts Network (AAN) says it is actually one of several death lists which were released in 1979 and 1980 by leaders who sought to justify their own seizures of power. Jafari says many families from Chendawol found the names of their loved ones on a list of 12,000 prisoners released by the Karmal regime after Amin was killed. "They had been buried alive, and those of us who survived remained in fear we would be arrested one day for participating in the uprising and face a dark destiny," he told Killid. Jafari wants justice. He is angry that only the warlords have benefited during the last decade. "I want to ask them have you seen your brother or father killed in front of your eyes? The families of martyrs pass their days in poverty. They (warlords) build fortified palaces with money gotten from the blood of martyrs." (*) The Killid Group has been publishing testimonies and life stories of survivors of war crimes. It is our contribution to creating greater public awareness about people's hopes and claims for justice, reconciliation and peace. 10.06.2013: A man accounts the horrors of detentions and killings by the Soviet puppet regime: "Prisoners screamed in agony as they were tortured in its rooms but the sounds stayed within the four walls"